In Manila, when you ask people where you can find the best baked salmon, chances are they'll point you to just one place -- Conti's. There's really something about Conti's Baked Salmon that has made us fall so deeply in love with it. This was also my Ama's favorite and we made it a point to order this whenever she would come over for lunch or dinner. So, what happens when I suddenly have the craving for Conti's Baked Salmon and I won't be home in the next 3-4 months to enjoy it? I learned how to recreate it! Thanks to my friends N and T for sharing this recipe with me. I first prepared this for my friends who came over to celebrate my birthday last June and once again for my uncles when Aku was in town in July. 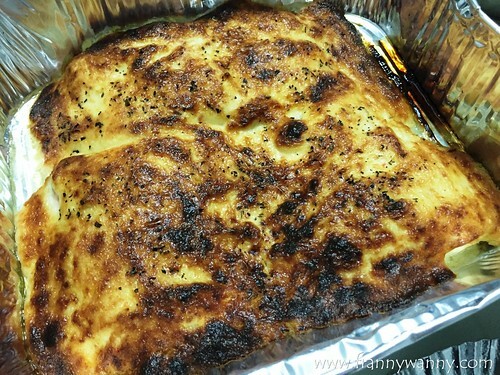 It has been a hit every single time that it has become one of my favorite dishes to prepare. Add to the fact that it's really easy to do! 2) Mix cream cheese, mayonnaise, garlic, chili flakes and cheese. Mix very well. 3) Pat the salmon filled dry and transfer to your baking dish. 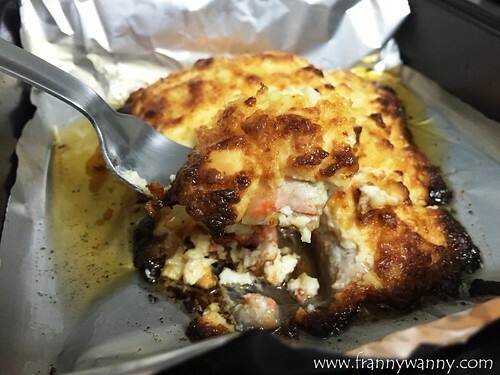 4) Top salmon with the cream cheese mixture. 5) Pre-heat oven 175 degrees Celsius for 5 minutes. 6) Bake salmon for 30 minutes or until the top turns golden brown. 7) Serve with buttered veggies and Enjoy! If you may have noticed, I'm using this classy looking salt and pepper duo encased in a pretty plastic grinder. 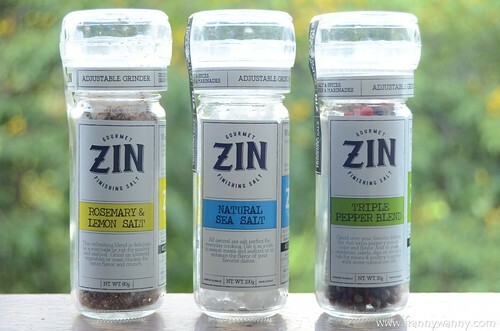 It's by my friends behind the brand Zin Manila in the Philippines and they've been coming out with flavored salts promising to give your dish a more interesting dimension. For starters, I got the Natural Sea Salt (Php. 150), Triple Pepper Blend (Php. 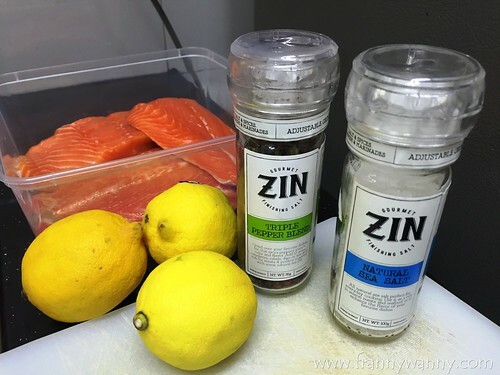 260) and the Rosemary & Lemon Salt (260). I'm having so much fun adding this as a rub, marinate or even directly to my cooked dishes and I love how strong the flavors are that that you don't need a lot to really bring out the taste. Check out Zin Manila on Facebook! Uy! This is also my favorite order at Conti's. Will try this soon. Thanks Idol!